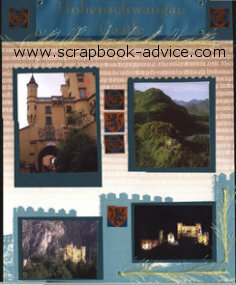 These Germany Scrapbook Layouts will concentrate on some of the more popular tourist destinations that I was able to get to while I was living in Germany many years ago. I had heard that King Ludwig II had built 4 castles during his reign and I wanted to try to see all of them. 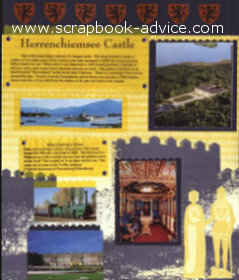 All pictures on these layouts are an assortment of my photos, and images from some of the brochures I picked up along the way. 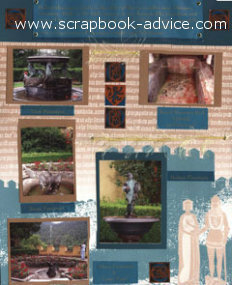 Much of the text in the journaling actually comes from the information in the brochures and from research done later while I was putting together my scrapbook. All of these pages were 12 x 15 tall and since the photos were much older they were smaller allowing more photos on each of the pages. These two layouts concentrate on the first two of the castles. 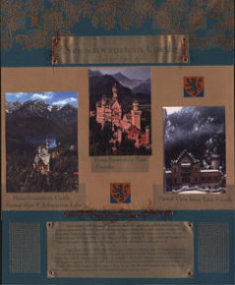 For the background paper I used the Club Scrap Renaissance papers with the images of the castle walls. All the text and titling was done on the computer using for the title decorative lettering which was later embossed with a dark purple metallic embossing powder. All of the text was printed on gold vellum which was attached with eyelets at each of the four corners. The top border on the right side is stickers also from the Club Scrap Renaissance Kit. For these two castle layouts I used different background papers from the Club Scrap Renaissance Kit - the dark teal and the copper. The kit came with a copper Magic Mesh and Copper Eyelets, so I used both of those to embellish the layouts. 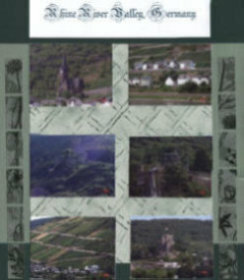 To be consistent throughout my Germany Scrapbook, I used the same computer font for the text and titles. For these pages it was printed in dark teal on Copper Vellum and attached at each of the four corners with the Copper Eyelets. I also used for embellishment, copper colored fibers run through the copper eyelets. 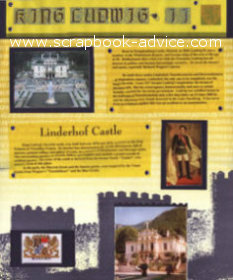 Again for these Germany Scrapbook Layouts, I used the Renaissance Kit paper and embellishments from Club Scrap. 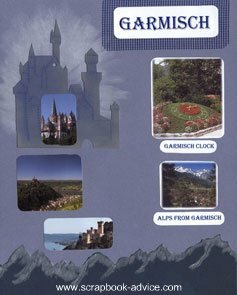 I used some decorative scissors to cut along the tops of the photos mattes to replicate the top of the castle walls shown on the background papers. The journaling and text on the computer were printed on the teal vellum and embossed with a yellow embossing powder to enable the text to show on the dark paper. Other embellishments include the yellow eyelets to attach the vellum journaling blocks at each of the four corners. The yellow eyelash fibers were strung through more yellow eyelets and stickers from the kit were inserted in the white spaces. 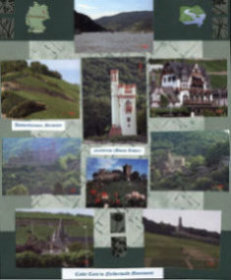 These next two Germany Scrapbook Layouts use the photos taken from the boat on the Rhine River cruise and the background paper, stickers and cutouts from the Club Scrap Earth and Herbs Collection. Since my Album used 12 x 15 inch pages, I used in the center 8 1/2 x 11 paper surrounded by borders of the light and dark green paper cut wide enough to fill the space. Journaling and titles for some of the individual photos was done on the computer on scraps of white photo paper in a dark green color to match the background paper. The only other embellishments were stickers from the kit and a small map of Germany that I picked up in a group of stickers related to Germany at my local scrapbook store. 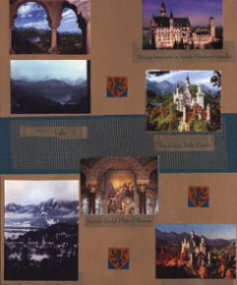 For these Germany Scrapbook Layouts I tried to convey the image of the height of the mountain and the early morning fog and gray sky so my background papers were just plain gray. My trip up the Zugspitz on that tiny little rail car was quite scary and very rough. Honestly, I was scared to death. 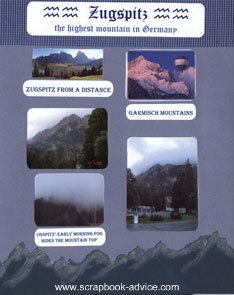 I found the mountain top die cuts at my local scrapbook store years ago in a gray that was several shades darker than my background paper. I used those for the bottom border of the pages but used white and light blue chalk on the peaks to depict the snow. I also found a castle die cut and chalked some of the structural lines a darker blue and then used a white chalk to emphasize the background lighting behind the castle. The chalking accents are subtle, but make a big statement. For more information on chalk and chalking techniques, check out our Chalk Embellishment Tutorial page. Journaling was done on the computer in dark gray, again on scraps of leftover photo paper. Titling was backed by dark gray Magic Mesh. 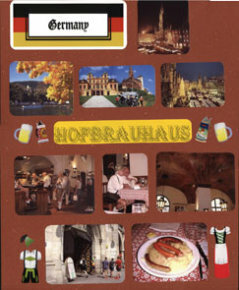 For these Germany Scrapbook Layouts, I used a solid background paper in Rust as I had so many photos and stickers to use, that I thought it needed a solid to keep from being too busy. I used another castle die cut accented with rust colored chalk and computer journaling to match the colors in the German flag from the sticker package I picked up from my local scrapbook store. There is very little text or labels for the photos because by the time I scrapped these, they were about 20 years old and who can remember that far back. I was surprised at myself that I actually took a photo of my meal at the Hofbrauhaus, but seeing that I do remember how good I thought it was! 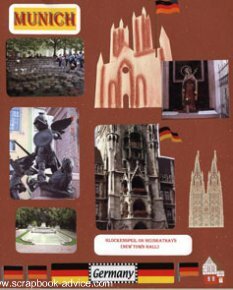 I hope you enjoyed some of these layouts and that they give you some good ideas to use for your own Germany Scrapbook Layouts, no matter how old your photos might be.